In 2001 a 40 pound bag of dog food cost me 20 dollars. This was for the better brands of the day. In 2005, with a bit of searching I could still get 40 pounds for 20 dollars. Then changes came to corn. After Hurricane Katrina, adding ethanol to fuel became big business. Corn prices skyrocketed as bio-fuel roared into the forefront of everyone’s mind. A side effect of these changes in corn prices were changes in food prices. Corn is in everything but this isn’t an article about corn. Corn is a common ingredient in dog food and as the cost of corn increased so did the cost of dog food. Now, one may say, “Get corn free dog food!” Today, that is a simple task. Eleven years ago, it was harder and there was not the work to remove corn from a dogs diet. The other side effect was that bags of food got smaller. It used to be that 40 pounds was an average size bag and 44 pounds a special. That changed and the weight started to come down. Many products did this including cereals and ice cream. The price and the package were the same. The weight was less. Now, move to 2016 and a large bag of dog food is often between 30-36 pounds. A high grade food may have its largest bag at 28 dollars. Feeding your dog has never been easier, harder, and more expensive. In 2008 I transitioned over to raw feeding. I left the world of commercial made dog kibble behind me. No more bag reading, ingredient checking, and finding out between one manufacturing cycle and the next a key ingredient had changed that my German Shepherd was allergic to. I could swing into the grocery store and buy my dog raw meat for less per pound then dog food. It was blissful and my dogs thrived on a prey model raw diet. Then the great recession happened. Food prices soared and I watched my price go from 60 cents a pound to over a a dollar a pound. It was now on par with dog food if not cheaper. But, it requires work, forethought, and a deep freezer so that I could buy up deals. Now today I am down to two dogs. I have not had only two dogs in fifteen years. It is an odd feeling. Next week I will be back up to three. However, I need puppy food for the first time in a long time. Puppy food has changed over the last decade. As the generic ‘puppy’ formula has proven to not manage the wide types of dogs out there different formulas have appeared. Small breed with higher calorie contents to manage hypoglycemia. Large breed formulas with decreased mineral contents to not overstimulate growth. There is no one size fits all formula for dogs and the pet food companies have responded. That still leaves a wonderland for the owners. If you are fascinated by dog food dogfoodadvisor.com is a great site. However, there is one rule that we must remember. The best food is the food a dog does well on. Some dogs do well on ‘cheap’ foods and poorly on ‘premium’ brands. Never ignore the dogs condition for the food. I’ve been using Prunia products for a while. They were for a time the best of the best. They’ve become midgrade and low grade depending on who you talk to. Once Eukanuba was the top brand on the market. My dogs however, have always done well on ProPlan so I keep using it. My breeder uses Proplan Focus Large Breed Puppy. At petsmart and Petco it is about 45 to 50 dollars a bag. I discovered it for 40 on Amazon and thought myself quite fortunate. Not knowing my pickup date, I shoved it in my cart. That is my holding spot for things I want to buy. Checking my amazon cart, as I am wont to do, I saw the price plummet to $32. I am looking at a 34# bag of food. This puts my cost at UNDER a dollar a pound. Just under, but still under. I ordered a bag. It would be fine sitting around for a week or two. At that price, I was fine with it. Then, on Sunday I got my puppy pickup date for the following week. The price on Amazon was still $32 dollars. I ordered a second bag. You may have guessed that I am an Amazon Prime user at this point. The bags ship for free with Amazon Prime. Prime membership now costs $90 a year. That membership covers myself and my husband. We both order things from Amazon at least once or twice a month. Prime membership increased that. I can buy my hair product for instance for a dollar more at Amazon than Walmart with it shipped. That means I no longer have to take a special trip to Walmart for the product. That is on the low end. I buy books, dog supplies, and about a quarter of the stuff I buy online these days. 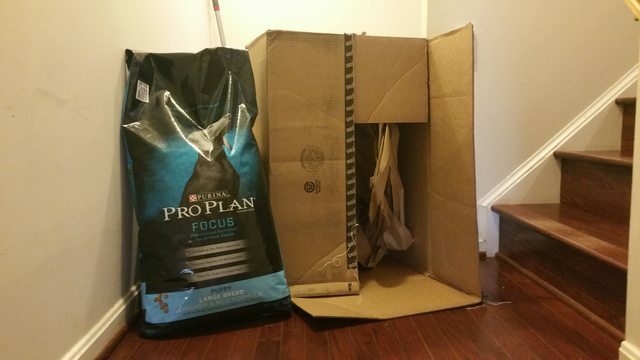 My prime membership pays for itself and NOW I have dog food delivered. I don’t begrudge petstores things. I think, however, having several dogs for so long has ruined me a bit. I cannot just accept the cost handed to me by another. Dog food expense has been part of my budget since I started to work. Money is not unlimited for many of us. Compare prices. Look at trusted online retailers. Preplan. You may find an amazing deal along the way. Puppy Selection is perhaps one of the most exciting moments of obtaining a new dog. From all of those cute bundles of fluff and fat little legs is your future partner. It is also a moment that should be approached with thought and precaution. When I decided to bring Intuition into my life I had not purchased a dog for six years. 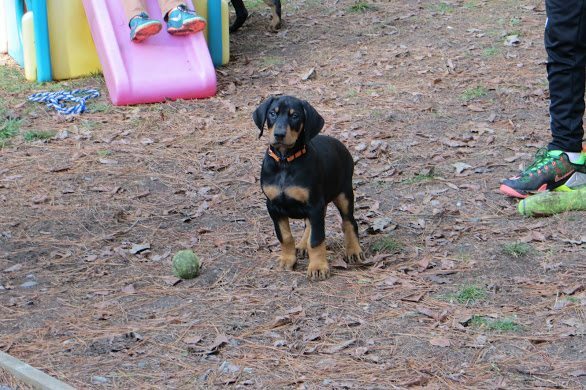 The last dog that I selected was Autumn, my husband’s Doberman. My plans for picking Autumn were simple. I needed a middle of the road puppy. I needed one that clicked with my husband. In a way it was easy because most puppies are in the middle. Autumn was one of two available red females from the litter. I wanted a red and another female. My husband picked up the first available little girl and she licked his nose, cuddled into his arms, and went to sleep. He was in love. How could I blame him? However, I made him put her down and interact with the other female puppy. When he put the first puppy down she trotted off to play with the other puppies. Next we found the other available red girl. She was happy enough to be picked up but she was somewhat indifferent. My husband of course wanted to go back to the first puppy. I however wanted to observe them. My breeder had a puppy meet and greet day where she meet everyone, they met the puppies, the puppies got socialization, and questions and answers could be had. I watched to make sure both puppies were active and social with each other and the people. There is always the chance that the adorable sweet puppy is just tired. The puppy that had so caught my husband’s attention was alert and playing. We scooped her up again and she again licked my husband and settled into his arms with a contented sigh. That was that. He wanted that puppy and I was fine with his selection. For my husband, picking up a dog and having that dog want to relax in his arms is important. A Doberman Pincher will outgrow being carried but those are early signs of a dog that will enjoy being cuddled. My husband is a cuddler with his cats and dogs. We needed a dog that was content when given attention and that is what we got. Autumn is a very great dog for a novice dog owner. She is sweet and soft tempered. She does not have the most confidence in the world and she would prefer to follow. This makes her easy to train because she does not push the boundaries of what she learned. In fact, it can have opposite and unexpected consequences such as accidents in the bed because she was not given permission to get down and my husband was moving too slowly. He learned not to take an hour in the bathroom after he got up and before the dog was walked! Puppy personality starts to show very early. A breeder should know each of those personalities. Who is pushy, who is sweet, and who is soft tempered. I produced one of the softest tempered dogs I have ever met in my first litter. His solution to everything he did not understand was to collapse and wait for you to save him. He was one of the most frustrating dogs I have ever worked with. Even a glare could send him into a puddle. I sent him home with a middle aged lady who had an elderly mother that she cared for. She was a sweet woman who never raised her voice and was often a doormat. It was a perfect fit. He was even softer than she was and he never challenged her and she never made him insecure because she worshiped him. Many other dogs would have been too much for her and taken advantage of her nature. This dog lacked the ability to do that. As I caught up on current dog psychology, I saw that a lot of theories about pack behavior, dominance, and alpha behavior are headed out of the door. I was not surprised by this. Having lived with and raised dogs, I’d learned that it was not about being alpha. It was about being in charge and confident. It was about not letting dogs discover that they could do bad things. By putting them in positions of success you conditioned them to the behavior and lifestyle you wanted. Raising Afghan Hounds left most training tools out of my reach. They are not food driven. They are not reward driven. They are not toy driven. My entire training method had to revolve around environmental conditioning and time. This eventually became a habit and as I added dogs to my house they all came into the same structure. Now, fast forward ten years. I’m down to one Afghan Hound and one Doberman. Both are adults. My Afghan Hound is 11 and my Doberman is Autumn from above and she is six at the time that I write this. Six weeks ago I lost Nyx, my other Doberman. She was an amazing, smart, responsive dog and I missed having her around. Autumn did not fill the void. I love her for she is a darling dog but she is my husband’s dog first. I will praise her on a walk and she will walk past me to my husband as if he is the one praising her. He is her world and I do not begrudge them that but I do miss it for myself. I went back to what worked. My breeder just had a litter two weeks before Nyx’s death. I asked for one of the available puppies and I waited to go meet them. I knew what I wanted. I wanted the boldest, most confident puppy in that litter. I’ve long wanted to do obedience and agility and I was at the point to do that. My husband teased me in the weeks leading up to meeting the litter. “What if you don’t like any of them?” he said. “What if they are all stupid?” or “What if they are all like Autumn.” He was teasing me. He knew I was hoping to fill a void in my heart left by Nyx. I was not trying to replace Nyx. I was simply looking for the next dog that I could develop that relationship with. Before Nyx was Nox and before Nox, Rakunna. Before Rakunna? Well, I was 14 when I got Rakunna. That is why her name was spelt stupidly. It is pronounced Racoon-ah. She had quite the racoon mask as a baby. But, I was worried. Chances were I’d fall in love with any puppy in the litter. Puppies are adorable. However, I wanted a standout puppy and I had a rare chance to select that. I was familiar with the breeder since this was my third dog. I was a perspective show home. She was not keeping any of the males. I had sent my deposit when they were two weeks old so I had first pick. You see, I not only like temperament in a dog, I like good conformation. The structure of animals has always fascinated me. I like a properly put together dog. Our beloved Autumn has a roached back. That means there is a slight arch to her spine instead of it being perfectly straight. The opposite is a sway back and that is often seen in older horses where the back looks like a U. My husband cannot see anything but her sweet, sweet eyes but her back and other small aspects of her conformation would bother me if she was my dog. Any dog can have good conformation. It is not restricted to show dogs. However, I have a good eye and I inadvertently pick dogs with good conformation. When we got to the breeder’s house we were the second people there. I was surprised at the flare of jealousy I felt. What if the other people had picked my puppy? I bit that down so that I did not jump the fence and bite someone. Instead, we knocked on the door, got let into the yard, and I walked around the house to see the puppies rampage across their yard. One puppy struck me immediately. He trotted across my view. Chunky and squat as they are at seven months he had good extension, carriage, movement, and a ramrod straight back. I was impressed. Other puppies came into view and they looked as nice. That one puppy had an orange collar and he oozed confidence in a way that is hard to explain after thirty seconds of viewing. I went into the puppies and was swarmed. All of the boys and one of the girls came over and crawled on me. They bit my clothing, chewed on my shoes, bit my hands, and gave biting kisses when picked up. No one puppy came and said, “pick me.” I was okay with that. I played with each one. I picked them up to see how they reacted. I tickled faces, rubbed backs, scratched butts and in general watched them interact. As a group they were bold, confident puppies. As the next family came they ran in mass to greet them. Orange puppy I noticed was in the lead. As the puppies did everything Orange was in the lead each time. He played with toys a bit more. Blue boy would cuddle anyone that picked him up and give kisses. Orange would give biting kisses as well nonstop. He was active but not trying to get down. He was just so excited that bite lick bite was all he could do. Eventually, the puppies got lunch and went for a nap. This may seem weird or boring. Don’t you want to play with the puppies? The answer is of course but it is good to see the puppies sleep. That means they were honestly awake when you saw them. A meal or being tired can present an unrealistic view of the puppy’s personality. While we were watching them sleep and chatting with the breeder (She was getting to know each group) the third family arrived. They were a couple with two children about 12, 8, and 3. The 12 and 8 year old were disappointed that the puppies were asleep but respectful. When told they could go pet the sleeping puppies they promptly did gently snuggling sleepy puppies. The three year old got worked up and was taken out by his father as his mother chatted with us. About forty-five minutes after they passed out the group woke back up. Here, the breeders husband spent some time rough housing with them. He scooped them up into his lap and arms and gently wrestled armfulls of puppy. They kept coming back to be rescooped and eventually they were sent outside to the yard. This was the best part of the day, to my surprise. The three year old was playing on the puppy’s toys. They have a small, childs slide to climb on. The puppies at first stared at this screaming floppy miniature human before deciding he must be fun and running around with him. There was no flinching or avoidance. Orange puppy wound up climbing him when he was standing next to the building which made him cry. At another point, the young lady from one family had put her bag down by the gate. Orange and Green puppy saw this and Orange was the first to go try to climb into her bag to see what it was. I wanted this puppy. However, the family with children also wanted him. He was so bold and playful and they naturally need a playful energetic puppy for their kids. Right? The breeder pointed out that Orange puppy was a bad pick. He would be knocking over their three year old to steal his food in six months. The puppy would outgrow the child physically, quickly. All of the puppies were playful and energetic. They needed one that was not, at seven weeks, already stomping all over their three year old. The breeder and I compared notes. Blue puppy was the sweetest. He was also a bad pick for the family with children. As the softest tempered puppy he might get run over by the kids and overwhelmed by family activity. Instead, the young lady and her husband who were first time dog owners was a solid pick for him. He would give them the room they needed to grow as dog owners. Red puppy was the most thoughtful and watchful of the puppies. He was a good pick for the house and children. He was not reactive to their noise or sharp movements. He enjoyed watching before stepping in but stepped in eagerly. This would be a dog that would take the time he needed not to be overwhelmed but also not shy in the least bit. That left green and orange. Green puppy and Orange puppy are very close in size and temperament. Green is a bit more mellow and that mellowness is made clear by how not mellow Orange was. 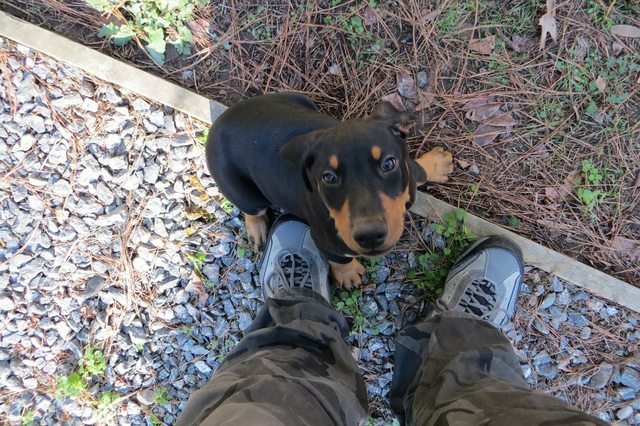 The last two homes were myself and another couple where the male half was experienced with Doberman. Now, a well bred litter is hard to make your choice from. Green and Orange are similar puppies in every way you want them to be. Both show all the signs of becoming beautiful Doberman Pinschers. Green puppy is right behind them and Blue is the third, being the most refined of the group and not in a bad way. The litter showed a consistency that was satisfying. Any of these puppies would do. But, I wanted that Orange puppy. In the end the breeder said she’d decide. She wanted me to have the pick puppy since I will show him if he turns out. She felt Green was a touch nicer but I felt that Orange had better movement. Orange was also the puppy of my dreams. My husband said to me, “When all the puppies went inside I hung out with Orange puppy for a bit. Now, that may sound shallow to you. Know that it would be if my husband was going to be Orange’s primary caretaker. He is an experienced dog owner now but he spoils his dogs. I get soft tempered dogs for him because he would allow a pushy dog to walk over him. But, with him being on board with Orange it means that he will forget every bad thing Orange ever did. As far as my husband’s memory is concerned, Autumn was a perfect puppy. She was far from it and proved to be a major challenge in a few areas due to a stubborn personality wrapped around a soft temper. You see, selecting a dog with as much personality and attitude as Orange (Known as confidence and drive) is a task you must dedicate yourself to. This dog is going to be a challenge. I will have to mold him into an exceptional companion without losing any of his spirit, confidence, or attitude. Yet, I cannot let him push me over or rule the house. I will have to train him. He will become the center of my life. We will have to socialize. We will have to go to classes. We will have to learn games and tricks to keep him mentally occupied. It was a hopeful dream come true. You see, raising a puppy is hard. I am going to miss the days of sleeping in. I also know they will come back. I will get tired of cleaning poop. I will want to lay around the house instead of walk. I will have bad days but those bad days will drown under the good ones. I’ll be bitten. I’ll have to replace something in the house. But at the end of it I’m going to walk out with an amazing, gorgeous, animal. I’m going to give this a try. Someone evil introduced me to it and after pondering the value I decided to toss a bunch of money down on it. BarkCrate – Is one of those mystery crate ideas. Lootcrate is one for games. Loot Crate once offered me one to review on my Eve blog. I had no idea what they were or that the idea was popular. I had no idea people offered bloggers stuff to review. Anyone offering me things made me suspicious so I declined. That was, probably, stupid. Free stuff and honesty are cool at the end of the day. However, that somewhat awkward encounter made me more open to the idea of the Bark Crate. Basically, select the size you want and each month they send you a crate. If you choose a 12 month subscription it costs $19 a month with free shipping. In the crate is supposed to be a mixture of toys, treats, and gadgets to interest you each month. New puppy means toys. I’ve always been somewhat bad about toys. I get tired of how much they cost. Dogs destroy them. I used to buy out PetsMart’s discount but I got tired of my dogs ripping the stuffies in two and pulling the squeaker. As my girls aged they lost interest in toys for the most part and we kind of drifted away from more then an occasional thing to chomp on. Well, now we are entering a new era of dog in this house. I’m looking at a high drive, toy focused puppy. It reminds me of my GSD (German Shepherd Dog) Nox. He loved toys and was my stuffy destroyer. He’d lay on his side and just casually munch on toys. After two hours of observation with this litter I knew I needed toys. I need toys the dog can destroy. I need them to be replaced easily. I hate shopping. I feel nasty paying 15 dollars a toy at PetsMart. This thing is kind of the best of many worlds. I get monthly toys for 20 dollars. I’ll get a lot of different types of toys and I can see what the puppy likes best. Anything unused can go to the shelter. The first year is often a time of mass destruction. With having plenty of toys on hand we will be more prone to throw away abused ones before they become dangerous. Next January I can reevaluate. If he is still toy focused we will continue with toys. If he isn’t, we will see what interests lay on the horizon. Once I get the loot crate I’ll review it. Now the site is all moved. I’m not completely up yet because I haven’t started scanning in drawings and I have not gotten the graphics tool I wanted. I expect comic production will be a month behind where I wanted it to be. That to is expected. It has been a very busy few months for me. Now, this domain is hosted on our server. The DNS is rerouted. Tomorrow, my hosting with BlueHost expires. I enjoyed BlueHost and would recommend them for general ease and stability. However, the cost increase after the introductory price was why I left. So! To the left should be my Eve Blogging. In the center my daily stuff which covers everything from gaming, to gardening, to pets with some personal reflection stuff. To the right, my attempt at a web comic. Above and below will be life with a new puppy and all that goes into a dogs first year.